OMG...What an amazing photo. The colors, the lighting are outstanding. Just beautiful. What a gorgeous shot. Superb colors and texture. You have a great talent! Wow! This only got 26th place? Message edited by author 2009-01-07 05:12:50. Not sure why your work keeps falling short to the voters, this is, again, a stunning shot. Your color work never fails to blow me away. Incredible shot, thanks for sharing your vision with us. I really love this one. One of my few 10s. I'm really surprised it did not score higher. Lovely work, keep at it! I knew this one was yours!! Such a beauty... Should have been a lot lot higher! AMAZING photograph.. 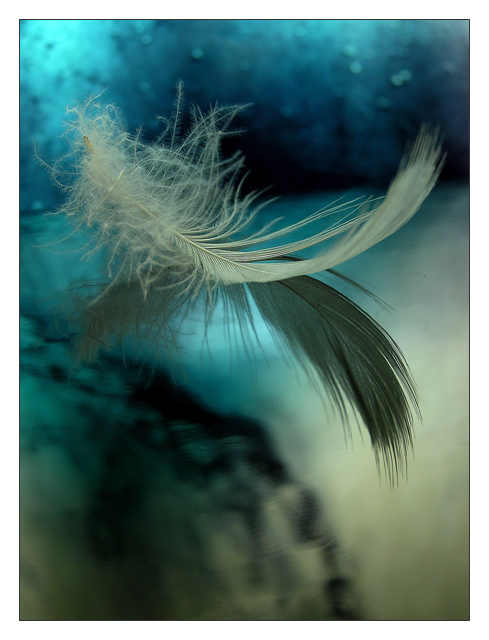 The texture of the feather against the mirror??? or is it water?? is just stunning. I would be shocked if this did not get a top 10. It has wonderful clarity and the blue colors in this really evoke a feeling of peacefulness. Adding to my favs..
Wow how did you do this? Selective blurring? Channelled a couple colors? I like the colours and the DOF. very nice. reminds me of a ribbon winning photo in the 'mirrors challenge'. Very interesting. It has an ethereal quality. The blues and gray/greens are very pretty. I like this alot. Quite an artful use of light and shadow. Im going to give you an nine to be conservative, but I hope the next person gives you a ten because this shot is a 9.5. Good luck. hmm, yeah this is good. wish the feather was a tad whiter. that's nitpicking though. Oh, this is so beautiful! Looks like a Dax to me :) (Hope it is, otherwise I'll be very embarrased.) How did you do this? 10 from me. Proudly hosted by Sargasso Networks. Current Server Time: 04/26/2019 01:40:06 AM EDT.